& Start Getting In Touch With 100% of Your Prospects & Customers Every Time! As you know, each time you send an email to your list, many of your prospects dont even get to open your message, never-mind read it! Spam filters. Even if your message isnt filtered there is so much spam around now that your message can very easily be confused with spam and get deleted. Ive done it, youve probably done it, and you can bet the people on YOUR list do it too! Youre probably wondering exactly what Contact Automator is. Well... its a revolutionary new program that allows you to create little applications that sit in your prospects system tray (The bottom right of your screen beside the time). This application will check whatever URL you tell it to as often as you want. And every time the URL updates, it lets your prospects know! * Newsletters - Guaranteed delivery of every issue of your newsletter -- no more accidental filtering or blocking of the e-mail version by ISPs and filtering software! * Special Offer Alerts - Your prospects get instant notification of all your latest special offers! * Backend Promoter - Strike up affiliate partnerships and promote them through Contact Automator. * Affiliate Updater/Motivator - Inform your affiliates of your new promotional material and products. Keep them up to date with their affiliate stats and motivate them to make YOU more money! * Membership Sites - Run your membership site through Contact Automator, now your members will always know as soon as you add new content. * Product Updates - Inform your customers of the latest updates to your products so they can get instant access without even opening their browser or email program! * Download Area - Have your website download area contained within Contact Automator so you can bring people back to your offers long after they download your freebies! The possibilities are endless. All these things will bring people back to your site again and again to buy your products! Let me show you exactly how Contact Automator works. All you do is simply open the program, fill in a few simple options, and press Build Application. Contact Automator will create a file ready to distribute to your prospects and customers! Imagine having your own custom branded software on thousands of peoples computers selling them your products! You can start creating your personalized software now. I am so sure that you are going to love Contact Automator, that I have put together this amazing guarantee! Your satisfaction is important, and I guarantee it when you order Contact Automator and I back it with a no risk, no questions asked, 100% money back guarantee. If for any reason, you arent completely satisfied with my product, just contact me within 30 days and Ill refund 100% of your purchase price. No need for explanations or excuses, just let me know and Ill refund your full purchase price on the spot. $97? $67? Well no, its worth MUCH more than that! But since this is brand new, I have decided to test the water and price this product at just $17, not only that, if youre one of the next 50 people to order, youll get an instant free upgrade to Master Resale Rights! Yes! 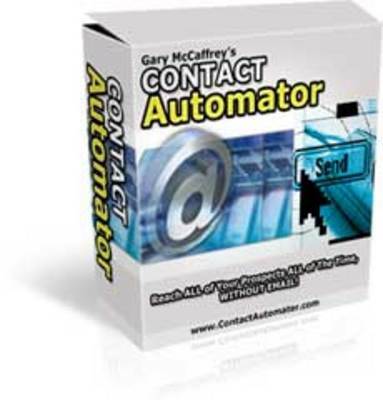 I want to order the Contact Automator software for only $17. I understand that when I order I will be receive and instant free upgrade to Master Resale Rights. P.S. Please remember, your 30 day no-risk guarantee makes this offer exactly that - totally without any risk whatsoever. In fact, the only way you could incur any risk at all is by not accepting this offer, and depriving yourself of the greatest success advantage that you might ever have the opportunity to discover. Contact Automator email marketing;marketing;marketing tool 79799077 21.00 netnug1 Fresh Download Available!